(photo taken from the website of the Central Tibetan Administration). The conclusion of this Tibetologist is indeed depressing. No change is happening at all? Or in other words, have the sacrifices through self-immolations in the entire Tibetan region not brought about any consciousness or any movement? In reality, the achievements and last words of every single self-immolator have been spreading extensively among local people, instigating tremendous reactions. For example, in Darlag County where Sopa Rinpoche self-immolated, several hundred Tibetans spontaneously destroyed thousands of knives, hunting guns and bullets together and swore that from then on they would never use weapons again, would never fight any internal battles, steal or kill; they strengthened internal unity. 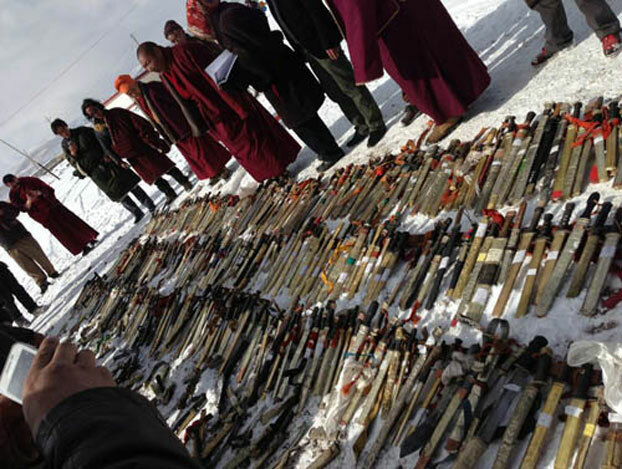 A different example comes from Dzamtang County where six Tibetans self-immolated in a row; several thousands of Tibetans also spontaneously collected huge numbers of knives, guns and bullets and handed them to the main Dzamtang Chode Monastery and Tsangwa Monastery to destroy them. They also swore to never quarrel or kill again. More and more ordinary people have been taking the initiative to destroy their knives and guns, which led me to think that this is more than just a simple wish to “never carry weapons again” or to “never kill again”. This has a more profound and long-term significance and also stems from a consideration of a possibly very dangerous future and represents one of many different local ways to respond to this. Why can we say this? I have and always will believe in the Tibetan land, there are so many outstanding senior monks and lay people who are constantly thinking about the challenging situation and sinister fate of us only about 6 million Tibetans. In order to be saved from being assimilated or extinguished, countless Tibetans are resisting by means of various measures, self-immolation is among the most bitter and desperate one. The Chinese government, continually increasing its repression, criminalising the entire families of self-immolators and labelling their behaviour as “terrorism” will one day in the future defame the entire Tibetan people as “terrorists”, their attempts to fabricate this collective image will never stop. The goal is clearly to thoroughly reverse the image that Tibetans enjoy in the world of being a non-violent and peaceful people. Through many years of cruel suffering, these outstanding senior monks and lay people are probably able to foresee this danger. Will today’s movement of throwing away and destroying knives that started in the Kham and Amdo regions not be a strong message to tell the world that Tibetan people will preserve their “non-violent” image by starting from personal sacrifices and will it not prove the attempt to label them as “violent” fruitless? Will it not perhaps make more Tibetans warn each other that for the greater good of continuing the existence of the Tibetan people it is necessary to willingly make these personal sacrifices? This reminds me of the various different ways of “non-violent non-cooperation” that happened in the aftermath of 2008 and included movements such as “not celebrating Losar”, “farming boycotts”, “Lhakar” and so on. Lay people, by giving up and destroying their knives, once more reflected this determination to continue the idea of “non-violent non-cooperation”. What is more important is that these movements are completed together with monasteries and monks. Many examples of “non-violent non-cooperation” cannot be separated from the influence of monasteries and monks. Non-violence is by no means simply talking about not being violent. Non-violence requires methods; there are already many examples of non-cooperation, what is necessary is careful and thorough consideration and strategic planning and guidance, so that the majority of people will quickly become aware of and knowledgeable about these ways of non-cooperation.